You can learn how to photograph glass by using either of two interesting techniques. I learned these two specific methods in 1980 when I was at photography school. Both methods I used were fairly complicated set-ups and needed a few lights to make the lighting work just right. 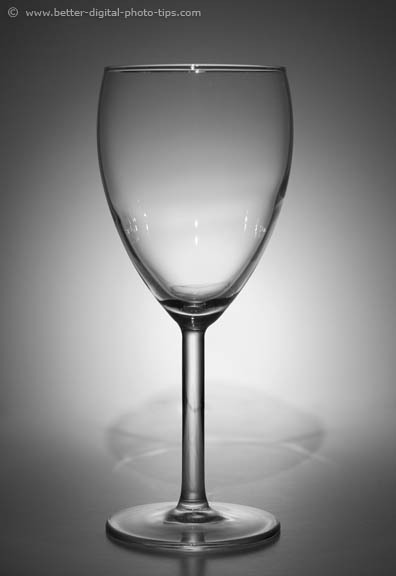 The lighting shown here on this wine glass is called white-line lighting and the other was dark-line lighting. Being the lighting geek that I am and liking to K.I.S.S. (keep it simple stupid), I thought it would be fun around with glassware lighting using a simple LCD flashlight. You can get the same interesting glass lighting with just a little experimenting and one single flashlight. 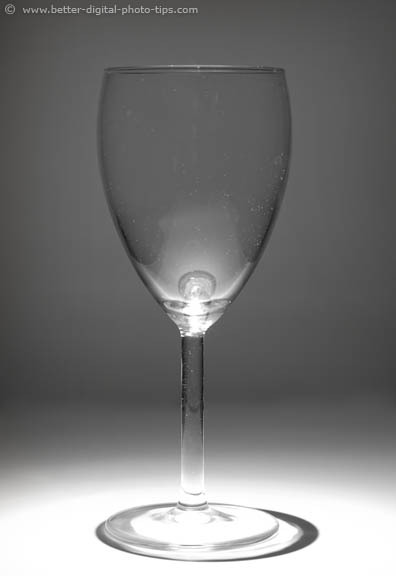 I originally wanted to name this article "7 ways to light glassware with a flashlight" but after playing around with the very-easy-to-use flashlight lighting I just named it how to photograph glass with a flashlight. Having a movable light source gives you an infinite number of slight variations in lighting and makes it easy to achieve an effect that you really like. Here is the video of my simple glassware lighting set-up. 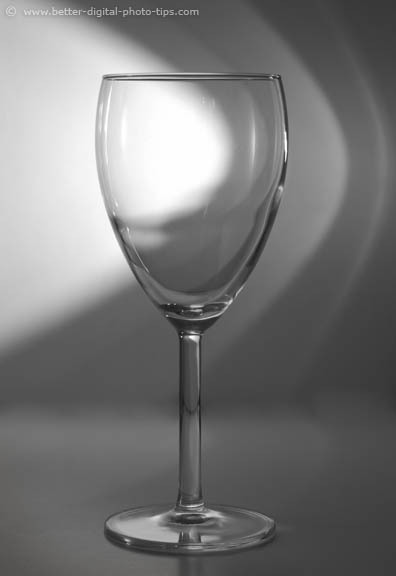 Here's a video to show you how astonishingly simple this one light method works for photographing glassware. You can do this set-up in any room of your house, provided you have a little bit of space and that you can get near complete darkness. 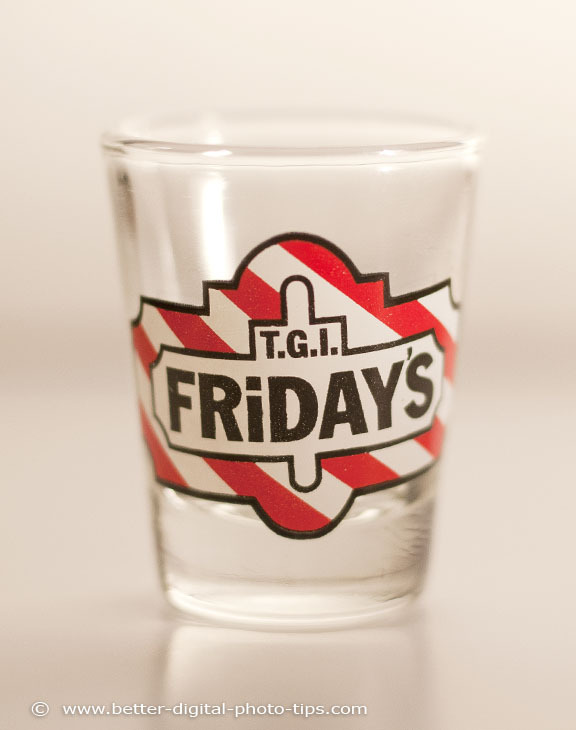 This shot-glass photo on the left is the kind of poor glassware lighting you achieve if you don't purposefully pay attention to the dark and light lines that glassware produces. This photo has flat lighting and had poor edge separation from the background. Glass is tricky to light because it is both transparent as well as highly reflective at the same time. Simply aiming a light source directly at glass will give you all kinds of trouble. Here are three of the more interesting glass photos that resulted from this quick lighting exploration. 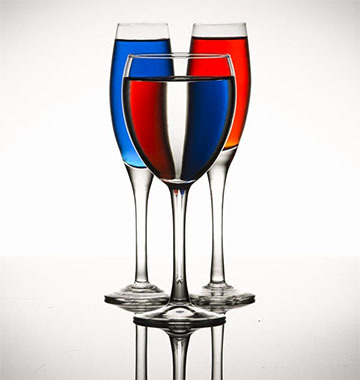 You can vote for your favorite one below the glassware photos. Which one do you find the most interesting? I did do these in a hurry right after shooting the video and had to do some retouching to eliminate the horizon in these photos. The background was was left over from a macro photography shoot I had just finished up. If have a little more motivation and you want to create a really sharp, professional still life, watch this video. It's a little more complicated than my simple set-up, but you can get more creative with colors when using the water and food coloring drops. This 2nd video is more about how to photograph glass as art. Tripod. Although it is possible to shoot glass by holding your camera, a tripod is really a necessity. Not only to accurately compose the subject and adjust the background, but really the whole point of this exercise is to allow you to play with the lighting by walking around and trying different angles and positions for your flashlight. Reflectors. Any light colored surface will do. Just remember the the color of the light source (the type of bulb in the flashlight) and the color of the reflecting board both affect the color temperature of your resulting photograph. A Dark Room. Any light source at all in the room will reflect on the shiny surfaces of the glass. There are some times that you may want to use any lights in the room intentionally. You just need to observe exactly how this light is affecting your glassware. Enjoy the process that is involved in learning lighting technique. This kind of experimentation teaches us to "see the light" and its effect on the subject as it happens in real time. Lighting is really what photography is all about. It can be a bit tricky to learn how to photograph glass completely without reflections, glare, or shadows, but it's definitely a lot of fun to play around with.